To gain weight, you need to exercise as much as your calorie intake. Exercise is important in this endeavour because you need to be able to digest the excess calories that you are consuming. This exercise sets you up for weight gain. The old-school exercise is quite effective when it comes to gaining bulk or mass. It involves multiple muscle groups and when you gain it is distributed evenly and you become stronger and bigger. Just make sure you have the right form for it to be effective and injury-free. Push-up is arguably the most popular exercise. It is not exactly a weight gain exercise but they condition your body towards overall gains. The movement works your core muscles along with the biceps, triceps, chest and shoulders. When you have mastered conventional push-up, you can advance towards one-handed and jumping push-ups. Bicep curls are not just to increase volume of the biceps, but also do wonders when you want to tone your muscles, define them and sculpt your frame. Try different variations and angles such as bent over row to make your muscles grow. There is no considerable body mass gain without bigger shoulders. 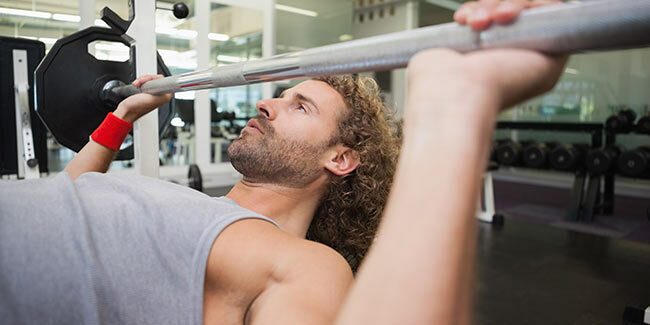 Barbell behind-head press is one weight gain exercise that involves every upper body muscle including the biceps, neck, shoulders, upper abs and upper back muscles to help upper body gain muscle and size. Chin-ups can be difficult at first but when you are able to master the exercise, you can see the effect of ‘three sets of five’ soon. These are some of the best exercises to help you gain weight. However, you must train your whole body for getting to the end result. Involving the whole of your body in the workout makes things easy as it aid the release of hormones throughout the body.